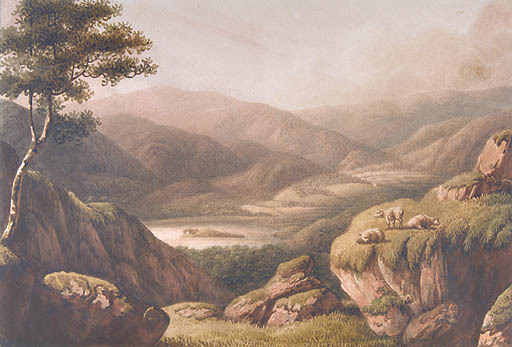 You can search for any of the following poetical effects used in Home at Grasmere (MS B) by clicking on the link below. Used for stylistic effect (usually in speaking and traditionally in rhetoric). A question asked aloud but without expecting an answer (or for which the answer is self-evident). E.g. from Home at Grasmere: "Who could look and not feel motions there?" A figure of speech in which a place, a dead person or an abstract idea (e.g. Nature) is addressed as if present and capable of understanding. E.g. "Embrace me then, ye Hills, and close me in"
A figure of speech in which one thing is described in terms of another. A comparison is implicit. E.g. "he was stung, /Stung by his inward thoughts"
A figure of speech in which one thing is likened to another. A comparison is made explicitly using "like" or "as". E.g. "Her Voice was like a hidden Bird that sang"
A word, phrase or clause inserted in a sentence which makes sense even if it is removed. It is usually marked by two brackets, dashes or commas. E.g. "No where (or is it fancy?) can be found"
The attribution of human qualities to inanimate objects. E.g. "Dear Valley, having in thy face a smile"